Spread the One Laptop Word: Write for OLPC News Today! Does One Laptop Per Child excite you? Do you want to share your passion with the five thousand daily readers of OLPC News? Highlight your opinions on OLPC progress? Or announce your own local XO user group? Then don't be shy. Don't delay. Email us a Guest Post today! As you express your learned opinions and ideas blog-style, in on-topic posts of 200-400 words, complete with quotes, links, and photos, you'll be joining a distinguished group of talented writers, commenters and contributors that span the globe. 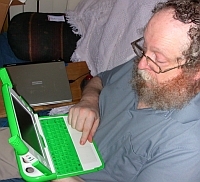 OLPC News authors also span a spectrum of thought, from fanboy to critic, striving to keep OLPC News your independent source for news, information, commentary, and discussion of the One Laptop Per Child endeavor. i think this is a wonderful thing that you guys are trying to do. i am a school child my self and i cant wait untile something like this happens at my school.. i Live in Aline Oklahoma and i think that my school is the smallest in the world untile i watched a video on 60 i cant belive that there was a smaller school than what i go to i was amazed! thanks for the invention!! Order Method: credit card. Early December they also took out shipping costs, without telling me they would. Known/Assumed Problem: They apparently lost my address. I supplied it again. Communications: Sporadic statements of regret. Ambiguous shipping dates ("within 45 to 60 days", "in the January February time frame") in emails, phone calls elicited no better information. On top of no laptop delivered, no tax receipt and requests for info on latter ignored. Hope Coefficient: Zero. Canceled order, awaiting refund to credit card. Already hasn't arrived in time frame they stated on phone. Surprise. Based on performance so far, anticipate refund will never happen until I take action through credit card.